In a previous post, I gave a general overview of what Osaka is like. Minami is an area where I have visited twice now and have been to many of the places in that area. 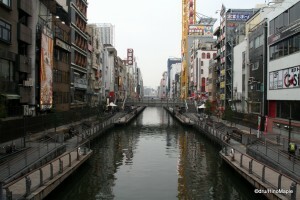 Minami is dominated by the tourist area of Dotonbori. Dotonbori is the central hub of Minami with its bright lights. To the north and northwest of Dotonbori is Shinsaibashi and America Mura, the main shopping district of Minami. 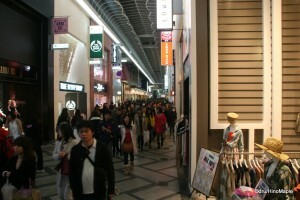 You can find various high end and independent fashion retailers in the Shinsaibashi and America Mura districts. To the south is Namba, an area full of shopping arcades, theatres, and other entertainment focused shops. 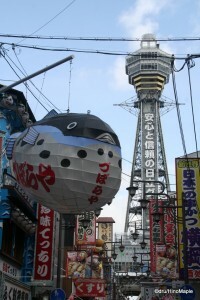 If you head to the southern end of Minami, you will be at Shinsekai, an area that is full of character. With this selection, there is something for everyone in Minami. It may be a bit too busy for many people but that is also part of the charm of visiting Minami. Hopefully you will take a day or two to visit this wonderful area and get a good idea of what it is like. 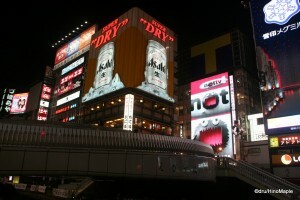 Dotonbori is the most famous area of Osaka. Bordered by two roads, it is an extremely busy area that is a sensory overload. The most famous point of Dotonbori has to be Ebisubashi. It is a bridge that spans Dotonbori Canal that provides a prime view of the Glico Man sign as well as other famous neon signs. It also happens to be one of the busiest pedestrian bridges in Osaka which can lead to people becoming frustrated as they try to get from A to B. It is fun to visit Dotonbori at any time of the day but you are better off visiting at night when the neon signs are lit up and shining in their full glory. If you proceed east along Dotonbori you will cross many famous shops. Dotonbori is well known for famous restaurants that promise to gauge you for all you got. While most chains will be reasonable, charging the same prices you will find throughout Osaka, some of the smaller restaurants will charge you a “tourist tax” due to the higher rents. If you happen to be in Osaka at the beginning of fall, be sure to hang out around Ebisubashi if there is a Hanshin Tigers game. It is well documented that whenever the Hanshin Tigers capture first place in the Pacific League, their fans will jump off Ebisubashi and into Dotonbori Canal. It is a bit scary to think of the dirty water that they are jumping into but it is a risk they enjoy doing as die-hard fans. If you head north a little, you will come to an area called Shinsaibashi. This area is well known as the posh district of Japan. You will be able to see many high end fashion shops along the main street as well as the main shopping arcade. While the shops tend to be higher end on the street, you can still find many great places within the shopping arcade of Shinsaibashi. It is an area that is within walking distance of Dotonbori and Namba. Next to Shinsaibashi is America Mura, Amemura for short. This is the “American Village”, which is notable for its larger foreigner population. It is also an area where you can see people who have more cutting edge fashion sense, especially in the hip hop area. You will notice that people here are more akin to the Harajuku area, yet it is still very distinct. If shopping isn’t your thing, you can always walk around the area directly between Shinsaibashi and Dotonbori. It is a somewhat dangerous area due to the high number of cars running up and down the small streets and large number of people wandering the streets as well. It can easily be considered the red light district of Osaka due to the larger number of hostess and host clubs. While it can be a little dangerous, like most of Japan, it pales in comparison to other red light districts in other areas of the world which can be very dangerous. The Namba Station area is the other major area of Minami. It is where you can hop on a train and go to many other places in Kansai. It is comparable to Umeda and Osaka Stations in the Kita area. There are a few department stores in Minami but it is more notable as being an entertainment district. 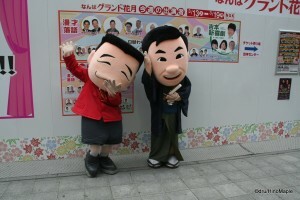 For entertainment, the Yoshimoto Theatre is the premier place to enjoy comedy shows. Yoshimoto is an agency that represents many of the largest comedian acts in Japan. The Yoshimoto Theatre has several comedy acts throughout the day and you have a good chance of seeing various Japanese comedians in the Namba area, although it is less likely that you will see a very famous comedian. Namba is also home to NMB48, a sister group of AKB48, a famous pop idol group. While NMB48 is not as popular as AKB48, they do have a few past members who did transfer into AKB48 and the talent within their group is growing each year. If AKB48 is too difficult to visit in Tokyo, NMB48 is a nice alternative. While entertainment is a major part of Namba, it is not the only feature. You can easily head south of the Nankai Namba Station to Namba Parks. 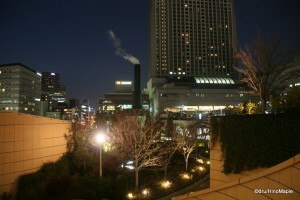 Namba Parks is a large upscale shopping mall with one of the most interesting gardens in Japan. There is an urban garden located on the top floors which has a step design. As you progress through the garden, you continually head up stairs till you reach the top floor at the southern point of the mall. It is a great concept and a great place to visit. It can be somewhat overrun with young couples looking for a cheap place to make out, but it is harmless. South of Namba is Shinseikai, an old throwback to the old days of Osaka from around the time of WWII. It has carried a black eye of being Japan’s poorest and most dangerous area for a long time now. While that may be true, it is by far not a dangerous area. It is an area that is harmless with many friendly characters. A lot of information on the area is a bit outdated as I went mainly to see “Festival Gate”, a defunct amusement park that became an abandoned amusement park. When I visited, the park was unfortunately in the process of being torn down with very little remaining of the actual building. What will come of the plot of land in the future is unknown to me. The actual area north of “Festival Gate” is the true Shinsekai. It is a set of small streets that is split into two sections. The southern section is modelled after New York while the northern section is modelled after Paris. The focal point of Shinsekai is Tsutenkaku Tower, a small tower with good views of Osaka itself. It is not an expensive place to visit but it is a busy place, even on weekdays. Do expect lines to go up to the top but if you are not interested in visiting the observation deck, a trip up to the second floor is free with various souvenirs for sale. Located next to Shinsekai and Tsutenkaku is Tennoji. Tennoji is dominated by the Tennoji Zoo, the Osaka Municipal Museum of Fine Art, and Tennoji Park. The Tennoji Zoo the only zoo within Osaka city but it isn’t very popular. The Osaka Aquarium is more popular and the Tennoji Zoo is often overlooked by people who are visiting Osaka. It isn’t a large zoo either but it is a nice area to visit. The Osaka Municipal Museum of Fine Art is very similar to the Tennoji Zoo in that it is generally not a place many people will visit. Tennoji Park is also a nice place but I was surprised to hear that they do charge admission to enter the park area. It is possible to walk through the entire area without paying admission as there are access paths to get from one end to the other for free. The worst part of this area is that everything is closed on Mondays unless Monday is a national holiday. It made the area very uninteresting for me as I visited Tennoji on a regular Monday but I hope it is interesting on other days. For the adventurous, there is a temple, Ishinji located to the north of Tennoji Park. It is a nice small temple that can get very busy at times. I stumbled upon this temple and found it to be interesting. It isn’t as traditional as the temples in Kyoto as there is a lot of metal adorning the temple itself. 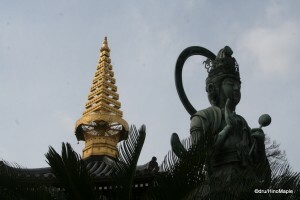 It is a little difficult to explain but the atmosphere of the temple itself is more interesting than anything else. I found that the culture of Kansai shows through as people “scramble” from area to area to do what they intended to do. It may not be for everyone but I had no regrets of visiting this temple. Osaka’s Minami area is a very diverse and vast area. You can easily walk to most of the main attractions and take trains to reach some of the outlying areas. It is a crazy place that must be seen with your own eyes. People often call Kyoto the cultural capital of Japan, but I would equally argue that Osaka is the same. While Osaka doesn’t have the same history as Kyoto, it has the people and food. It is a modern city that has a completely different feel compared to Tokyo. When visiting Minami, you have to get out at night to truly understand the differences between people from Kansai and people from Tokyo. The contrasts between the people can be astonishing. I do enjoy being in Osaka and their “let it be” attitude. People in Osaka can be very passionate and it shows in the architecture, bright lights, and the boisterous laughs on the streets. The food also stands out to satisfy everyone’s stomachs. While I may not visit Osaka anytime in the near future, it is a place that I would love to visit again now that I understand it a lot more. Update: I was recently informed that the area around Shinseikai (paragraph 5) is not as dangerous as I thought it was. The area to the south-west of Shinseikai is where most of the danger lies. Maybe I’ll be able to go there with my own two feet to check it out someday. This entry was posted in Kansai and tagged AKB48, Amemura, America Mura, comedy, Dotonbori Canal, Dotonobori, Ebisubashi, Festival Gate, Glico Man, Hanshin Tigers, Ishin-ji, Ishinji, japan, kansai, Kita, Minami, Namba, Namba Station, Nanba, neon signs, New World, NMB 48, NMB48, osaka, Osaka Municipal Museum of Fine Arts, Shinsaibashi, Shinsekai, Tennoji, Tennoji Park, Tennoji Zoo, Tsutenkaku, Tsutenkaku Tower, Yoshimoto, Yoshimoto Theatre by Dru. Bookmark the permalink. I think I remember hearing about that. Too bad I was there at night and couldn’t even consider it looking like that. Looks cool and makes me want to go back to check it out again. However, if I go back, I’d like to check out Kita area more next time. Tokyo goes to sleep at 11 am?! うそ！　I have to defend my beloved city! I defend my words. 11PM. The city is quite or heading home by 11pm. You can still find a few places that are busy but not compared to Osaka. Also, most places that are busy are usually busy inside and not outside on the street itself. Some exceptions do apply. Not buzzing that much but you can always find places that are buzzing. I guess the best way to put it is that Osaka is more compact. Rather than having several city centres, there is pretty much only 1 or 2. It is different though. I still love the fact that you can walk 1 block away from the entertainment districts in Tokyo and be in complete quiet. Maybe not 100% of the time but most of the time. I wish my Japanese were good enough to follow Osaka humour, but I can’t catch the numerous puns, especially when it’s delivered in Osaka-ben. No, one group isn’t enough. They also have HKT48 in Hakata, SDN48 for the older group (Saturday Night), SKE48 for Sakae (Nagoya), and JKT48 in Jarkarta. They have plans for one in Taipei and they have one for OJS48 (Ojiisan) too! Yeesh. I like Osakan comedians but it is hard to understand. I just keep trying to understand them as best as I can. That Tomomi girl…. can’t understand the attraction. 😀 I can only imagine what Zaini sees in them. I know who you are talking about. I think her name is Tomomi Itano. The orange/blonde haired one, right? Not the most popular of the group though. It’s not really Osaka humour; it’s just Japanese humour but the people happen to be speaking one of the Osaka-ben dialects or one of the others in the Kansai-Ben family of dialects. Even NMB48 does a decent job at manzai comedy although they clearly don’t have a decade of experience under their belts. If you work late at night with the TV on, you’re bound to run into it though. I mentioned to dru46 earlier in response to this blog post but there actually is a real red light district south of shinsekai but I recommend staying away from it. Shinsekai is not dangerous but it just has a bad reputation for things like labour riots in the past and for the large number of homeless day labourers that are in the area. After shinsekai, one can go through the tennoji park or zoo and find the tennoji area which has been built up a lot. Shopping complexes such as “AND” and “HOOP” are pretty convenient but the whole area is undergoing massive rennovation and revitalization. Abeno has a lot of history but it is slowly being revitalized. Hop a train heading south to Sakai City and you can find one of the historical metal regions. They make excellent chef-quality steel knives. I did update the post a little to reflect the dangerous pocket south-west of Tennoji station. Thanks for the tip and info. I used to feel a little uncomfortable walking at night by myself in Shinsekai, but in the daytime it really was one of the most interesting places in Osaka!